For this month’s Fashion Walk of Fame post, highlighting one of the designers honored with a plaque in NYC’s Garment District on Seventh Avenue, I decided to focus on Marc Jacobs since I’m waiting to hear if he is taking the top job at Dior, replacing John Galliano, who was fired earlier this year. I don’t know why Marc wouldn’t take the job, Dior is a haute couture atelier, which Louis Vuitton and his eponymous label are not, and would seem to present him with the ultimate challenge of what has already been a huge career. I think what he’s done for Louis Vuitton is pretty amazing—I’ve checked out those clothes on several occasions at the Greene Street store in SoHo and they are gorgeous, especially the coats with their sumptuous fabrics and wonderful detailing—so I would love to see what he could do at Dior. A lace coat and dress from the Marc Jacobs Spring/Summer 2012 collection. Photo by Monica Feudi. 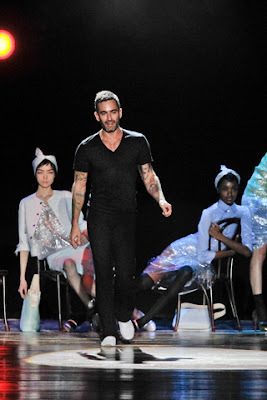 A fashion prodigy, Marc Jacobs has attracted attention from the very beginning of his career. Known for his clever, witty designs, as in his “Freudian slip” dress, he became controversial with his “grunge” collection for Perry Ellis in 1992. His current success, both for Louis Vuitton in Paris and for his own New York-based collections, rests on his ability to meld the past with the present. Marc after presenting his Spring/Summer 2012 collection. Photo by Monica Feudi. Marc’s plaque is on Seventh Avenue in NYC, between 40th and 41st Streets (in front of a Burger King! ), next to the designer Betsey Johnson. Thanks so much for this info Jill! I'd love to see him at Dior! Someday, Jill...you are going to be my guide in New York...I so hope to get there soon and look at the fashion district through your eyes...how great that would be!! You always wet my appetite for more of NYC! Hi Paula, I'm still waiting for news on this when I hear today that Raf Simmons is taking over at YSL. That's unexpected and surprising. I love Stefano Pilati and love what he's done at YSL, if the rumor is true, he will be missed! Hi Marina, you photograph so well that I think you could have any hairstyle you wanted and still look gorgeous! So my kind comment was just the truth! Hi Pam, oh if you come to NYC, we have to meet, even if only for an afternoon. We could go do some fun fashion thing together, I would be honored to be your tour guide! Hi Alexis, thanks for stopping by! How are you? It was great to meet you at the IFB cocktail party. Since Paris Fashion Week is getting underway I am hoping we will hear news about Marc moving to Dior, or not. I've read that if he does make the move Phoebe Philo at Celine could be tapped to take over at Louis Vuitton, which is another interesting idea since she is so different than Marc in her aesthetic. I love to look at their windows, I ride by the shop on my bicycle at least once a week. Beautiful! LV in Vienna will move to another building and Dior will move into the recent LV address. We have no Dior boutique in Vienna, not yet. All those lush purses were never available before. Hi Paula! I will check out that blog you mentioned, it sounds like a good one. As for Dior, I have seen some of their clothes, as I walk by in Bergdorf's, but haven't done the close inspection like I have at Chanel, where I am obsessed with the jackets. I am a pretty big Louis Vuitton fan and that's another place where I like to linger to see all the different things they have. I love that they are playing around with the addresses of LV and Dior in Vienna. Once Dior opens you should check it out and do a post on it, I would love to read it! Wow that's awesome, Jill I had no idea Marc Jacobs was honored with a plaque in the garment district. It will be interesting to see what happens as far as Jacobs joining Dior. I think it would give him a different momentum. sidenote:I love the Dior fragrance J'adore. Hi JTWisdom! I guess we will hear any day now whether Jacobs is making the move to Dior. Thanks for the link to the Dior exhibition, I will check it out. And I am featuring one inductee to the Fashion Walk of Fame a month, to learn (and share) a little fashion history! I LOVE Marc Jacobs and usually do a post each season on his looks! We must be very similar! Hi Reva, I love Marc Jacobs too, have you heard whether he's moving to Dior? I'm still waiting to hear. I thought it would be announced during Paris Fashion Week if it was happening.